The eastern Caribbean islands are sometimes referred to as the leeward islands (when you include Puerto Rico). They were called the leeward islands because they were to the lee side of ships arriving from Europe. The eastern Caribbean sea islands form the northern half of the arc of islands called the Lesser Antilles that separate the Caribbean Sea and the Atlantic Ocean. Most people (including myself) prefer the beaches on the Caribbean Sea side of the islands. These eastern Caribbean islands consist of the chain of small islands are headed by several English speaking islands, followed by a several Dutch and French islands and stretch from the British and U.S Virgin Islands in the north to Dominica in the south. There may not be a better place in the world to island hop! Most of the major cruise lines serve the eastern Caribbean, including Carnival, Princess, Norwegian, and Royal Caribbean. Most of the cruises make stop along the way in the western Caribbean islands of the Bahamas and Puerto Rico before making their way to the eastern Caribbean beaches of Antigua, ,St. Maarten/St. Martin, St. Thomas (USVI) and Tortola (BVI) among others. However, just because a cruise ship doesn't stop there doesn't mean that there aren't some beautiful, blissful places to spend your vacation. 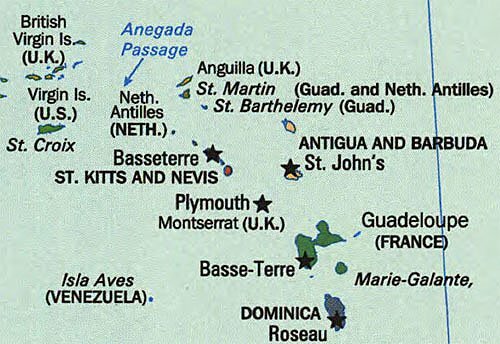 In fact, many of these islands are less "touristy" (my slang for commericalized), such as Anguilla, who has completely shunned duty free shopping and cruises to preserve its small island atmosphere. These islands often feel like your own private slice of paradise.